By refusing to speak out about his desire to play, he’s defending the principle that he deserves a job on the merits. After an off-season of lies about his character, disinformation about his statistical production, concern-trolling over his vegetarian diet, and harassment generated by the cheap bully in the White House, NFL execs and their trusted gatekeeper journalists have offered an olive branch to Colin Kaepernick. Maybe Colin Kaepernick will do such an interview in the weeks ahead, and by all means that is an interview that I, or any other sports reporter, would leap at the opportunity to conduct. But it also worth defending the message that Kaepernick is sending by not consenting to such an interview. Kaepernick is being asked to go on a TV tour to explain in heartfelt terms why he should have a chance at a job. Usually these kinds of media campaigns are reserved for players looking to get back into the league after a criminal matter, such as after Michael Vick was released from federal prison and was on 60 Minutes with Tony Dungy or when Ray Rice was on the Today show alongside his wife Janay after footage was released of him striking her in an elevator. We also see these campaigns when players are trying to revamp their image, reassuring their fan base that they’ve found Christ after being accused of sexual assault, as did Steelers quarterback Ben Roethlisberger. The idea at work is that Kaepernick somehow did something wrong by taking a knee during the anthem, something amoral, something that demands atonement. The rhetoric that he needs to “make amends” with fans and the league ignores the fact that—while his politics are certainly polarizing—former players and coaches swear by his character and fans are still keeping his jersey among the league’s top sellers. What this is really about is owners seeing if they can break him. He needs to be publicly broken so the blackballing can have its desired effect: a shot across the bow at any player who thinks that they can use the field to express their politics. With so many NFL owners supporting a disastrously unpopular president, their desire to crack the whip makes all the sense in the world. 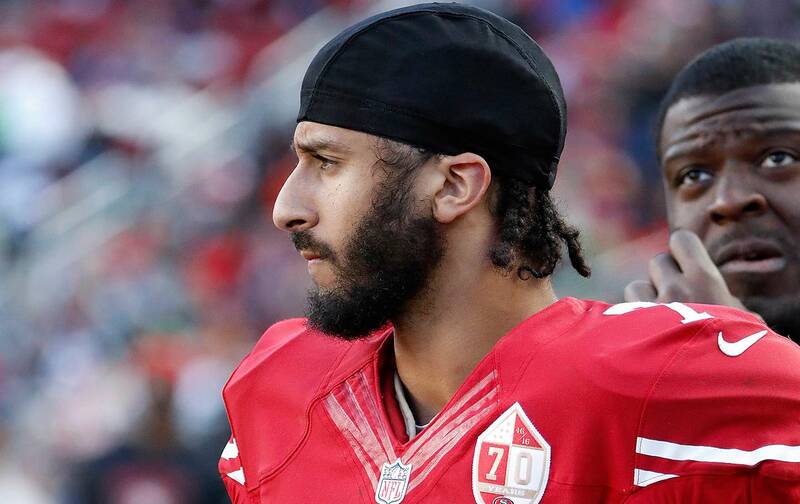 If Kaepernick can show that they’ve broken him, they’ll take him back. It reminds one of the Martin Luther King Jr. quote that “a man cannot ride you unless your back is bent.” But Kaepernick won’t bend to this. He’s not chasing brand appeal or paychecks and that makes him resistant to the coercion of owners. He just wants to play football and thinks he should because he had a great season and is by any measure better than—at minimum—half the quarterbacks currently on rosters. No one is asking quarterback also-rans such as Austin Davis or Mark Sanchez to explain whether they in fact deserve to be in the league. No one is asking the quarterback whose job Kaepernick took last year, Blaine Gabbert, whether he has the right to his job as a backup on the Arizona Cardinals. There is a principle here that Colin Kaepernick is defending through his silence: the principle that he deserves to play in this league on merits and that that should be enough. The NFL often asserts that teams just want to win and they are, as Roger Goodell bleats, “a meritocracy.” This embarrassing off-season has exposed this to be a lie. Colin Kaepernick should not have to plead on Good Morning America for a job. If NFL owners could just keep their politics out of sports, he wouldn’t have to.